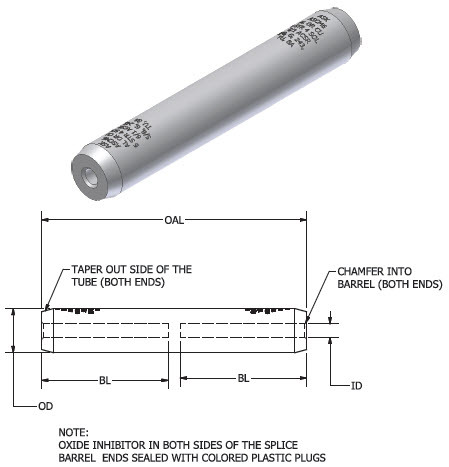 Tapered Barrel End (Double Chamfer) Provides Protection Against Hi-Voltage Corona Effect. Standard Barrel Compression Splices allow for maximum compression, homogenizing cable and splice, producing optimum conductivity and pull strength. Center Stops for Secure Compartmental Separation. Same Cable Size or Range compression crimped on both sides of splice. Crimp Instruction Ensures Compliance with ANSI C119.4 and UL486B performance criteria. Heavy Wall for Maximum Amperage and Conductivity "Safety Factor"
Dual Metallic Application: Aluminum to Aluminum, Aluminum to Copper.